The Colts will head back onto the practice field this afternoon in preparation for the St. Louis Rams. Today’s news looks at hazing around the NFL and the extra attention Colts receivers will be receiving with T.Y. Hilton’s stellar play. Take a look below at the top pieces from Wednesday, November 6th. With the hazing news around the Miami Dolphins locker room, talk is around the NFL on whether this is prevalent with other teams. It occurs in every NFL locker room — yes, even with the Indianapolis Colts. But here in Indy, there are a few, well, subtle differences from the despicable accusations being levied against Miami guard Richie Incognito for his treatment of teammate Jonathan Martin. If you’re a rookie here, you had better not forget the sunflower seeds. That’s a must. And you’d be wise to carry veterans’ helmets and shoulder pads to the locker room after practice. But that’s as deep as it gets in the Colts’ locker room, according to players and coaches. More troublesome hazing has long been considered off limits, going back to at least to the earliest days of former coach Tony Dungy, who was hired in 2002. “Nothing to the extreme where you have a person pulling a no-show, messing with their confidence or anything of that nature,” outside linebacker Erik Walden said. “I don’t really (believe) in that. Who’s going to help T.Y. Hilton at receiver? After a second-half to remember, the attention will certainly grow for T.Y. Hilton. How will that affect the rest of the Colts receivers? Things aren’t going to get easier for Hilton. He’ll likely start seeing some double teams as opponents try to slow him down. 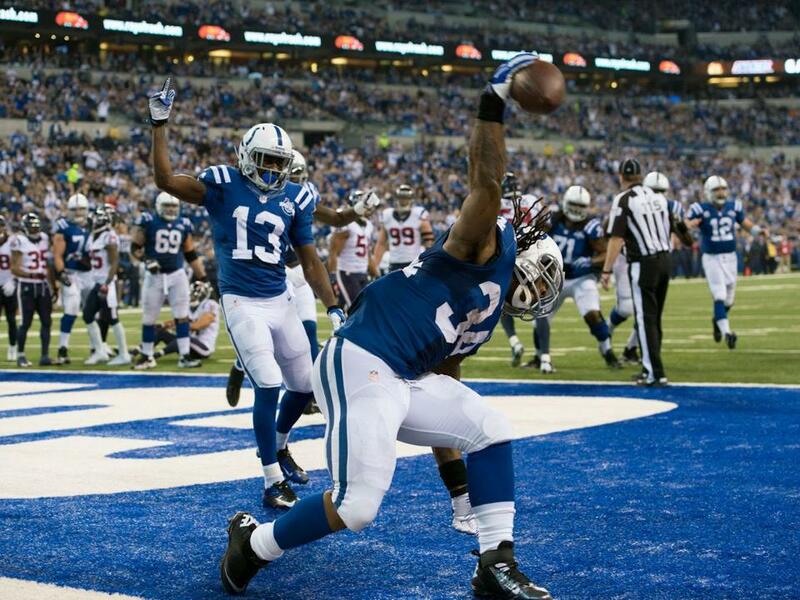 INDIANAPOLIS – The Colts are 6-2 and have a two-game AFC South lead at the season’s midpoint. The wins that followed a loss at San Diego came in dramatic style over unbeaten Denver and against a 2-5 Houston group fighting for its 2013 survival. The Colts produced a 10th comeback win under Chuck Pagano by wiping out an 18-point halftime deficit in a 27-24 victory at Houston. Plays were made across the board in keeping a two-game AFC South lead over Tennessee. PERFECT WITH PERFECTION – The Colts are 7-0 under Pagano (3-0 in 2013) in turnover-free performances. That the club has seven in 24 outings (almost 30 percent of the time) is a pretty healthy percentage and is a testament to his ball security preaching. Prior to Pagano, it took a 37-game span back to 2010 to encompass seven spotless performances. The Colts’ six giveaways lead the league. Only four other teams are in single digits. Three of those seven miscue-free games have been on the road, further evidence of the ability to play like Pagano preaches. LUCK REMAINS MASTERFUL – With 10 game-winning drives in fourth quarter and overtime, Andrew Luck has the most of any quarterback in the first two years of a career since 1970. Luck’s manner in the huddle and calm leadership style affects teammates deeply. “Andrew basically takes control of the huddle. He’s telling us, ‘One play at a time, one play at a time.’ He’s focused,” said Castonzo of Luck, who must have read Kipling while earning his architecture at Stanford. 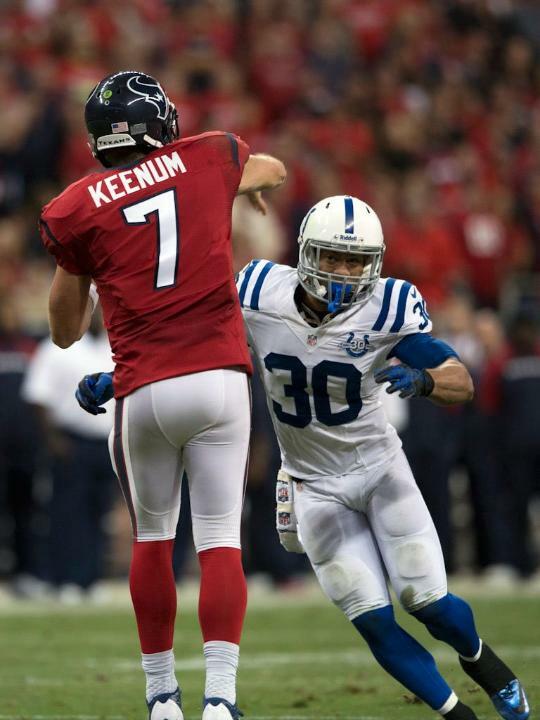 Even after the latest Houdini act, Luck credits teammates and coaches first. There is no “I” in Luck. If a player can have a virtuoso career after 24 games, Luck has done it. LINEBACKERS MORE THAN MATHIS – Houston was able to neutralize Robert Mathis probably better than any team this year. Still, Erik Walden had a 10-yard second-quarter sack of Case Keenum that preceded a missed field goal that would have put Houston up, 17-0. After the Colts took the 27-24 lead with four minutes left, Mathis and Angerer stopped Ben Tate for short yardage around midfield, then Angerer stayed at home and dropped Keenum for a three-yard loss on a Pistol keeper, a superb one-on-one effort. On the ensuing play, Mathis contained Keenum and Angerer delivered a hit on Keenum’s release. Keenum’s pass hit Walden in the facemask and Mathis nearly corralled the ball for a touchdown. Three linebackers, three plays in the clutch, and the Colts forced a punt. While Angerer’s 12 tackles topped the team, Walden was in the middle of key moments for a second straight game. PRODUCTION PAST WIDE RECEIVERS – With Reggie Wayne gone for the season, developing production past the wide receiving corps is a must. Luck hit wide receivers 12 times in 29 targets, with more plays being made in the second half than the first. Indianapolis was able to get three receptions from Coby Fleener, plus a critical two-point snare. Trent Richardson had two receptions, including a 24-yarder that set up T.Y. Hilton’s third TD. Success in spreading the ball paid dividends, and the club must continue that as Luck’s cohesion with wide outs continues to develop. With the players away from the complex, the news has simmered down a bit for the Indianapolis Colts. Today’s news looks at the play of Erik Walden and Andrew Luck’s honor. Take a look below at the top pieces from Thursday, October 24th. For Erik Walden, Sunday’s win over the Denver Broncos was a coming out party of sorts. After the season, the Packers elected not to bring him back. Grigson hauled in him, part of roughly $140 million spent on free agents in the offseason. Through six games, it was the Packers, and not the Colts, who appeared to have gotten the better end of the bargain. Everything was different Sunday because Walden was everywhere: Of Denver’s four turnovers, he had a role in three of them. Every Wednesday, the NFL announces their weekly awards and for the first time in 2013, the Colts were recipients of some honors. The NFL announced today that Indianapolis Colts quarterback Andrew Luck has been named the AFC Offensive Player of the Week for Week 7. This marks the second time Luck has earned the award in his career. 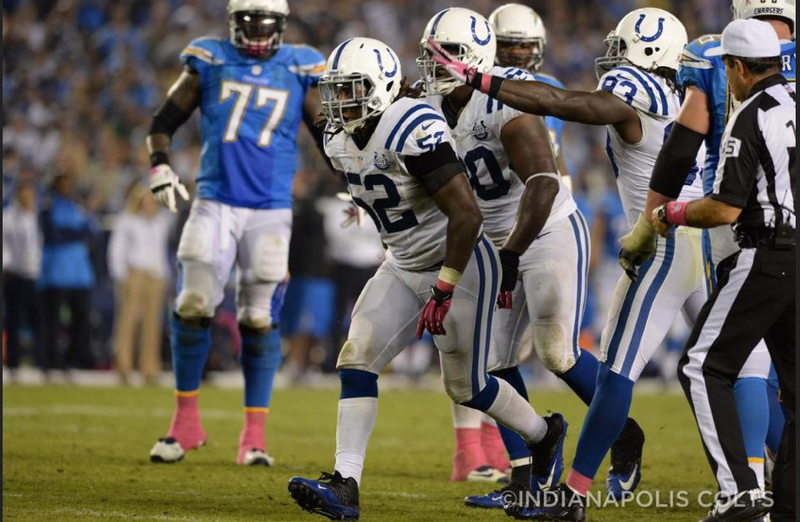 Last week, Luck led the Colts to a 39-33 victory over Denver on Sunday Night Football. He completed 21-of-38 passes for 228 yards and three touchdowns for a 99.5 passer rating. Luck also rushed for one touchdown in the game. With four total touchdowns, Luck tied his single-game career-high (four at Detroit on Dec. 2, 2012). His three touchdown passes are the most he has thrown in a first half of his career while his 199 passing yards marked the third-highest total for a first half in a single game. Luck’s rushing touchdown was the eighth of his career, which ranks second among NFL quarterbacks over the last two seasons. With the regular season back in action, the Chuck Pagano show returns hosted by ‘Voice of the Colts’ Bob Lamey on Monday night.